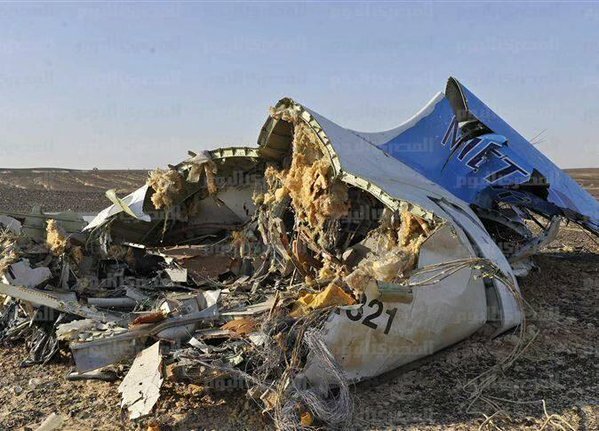 The Russian Metrojet Airbus A321 aircraft that crashed on Saturday morning in Sinai broke into pieces in midair, a senior Russian aviation official said today. The crash killed all 224 people aboard Flight 9268. Footage from the scene showed mangled wreckage from the plane spilled over a largely flat, barren landscape. Peter Goelz, a CNN aviation analysts and former managing director of U.S. National Transportation Safety Board, told the network that the catastrophic failure in the plane could have been caused by maintenance problem. “It could have been a center fuel tank that might have exploded,” Goelz said. Air traffic control recordings don’t show any distress call, Egyptian Minister of Civil Aviation Hossam Kamel said today. Islamic State Sinai Province, an ISIL affiliate, on Saturday claimed responsibility for the crash of the Flight 9268. But Egyptian and Russian officials dismissed the claim. It is not known, however, if the investigators have ruled out a terrorist act, like the explosion of a bomb during the flight.